Recently, I have been reading different genres of books because I want to expand my vocabulary. As a writer, it is very important that I read various books to improve my writing skills. One of the books that I have been reading is part of the Heist Club 2016 anthology, entitled “Chasing An ATM Scheme”, written by Racquel Sarah A. Castro. It is also the first book of The Fraud Hunter series. PO3 Gabe Jacinto has been chasing ATM schemer, Teri Francisco for years. Ever since he found out that she has been victimizing people around Metro Manila using ATMs, he vowed to catch her and give justice to these victims. What he doesn’t know is Teri has a reason why she has been doing this, why she has been stealing other people’s money that they worked hard. Ordinary people wouldn’t understand because she has been through a lot. Racquel Sarah A. Castro is living with Cerebral Palsy. She graduated with a Bachelor’s degree in Information Technology in AMA Computer College-Binan Campus. She wrote “When Fate Speaks Big Time”, “Second Sight to Forever”, and “Encyclopedia Mystique”. Racquel is a geek, a math tutor, a food addict, a web designer, and a freelance programmer. Her family is currently a ground volunteer in Basics Global, a nonprofit organization based in Dubai, UAE. She also leads the music ministry branch of Jesus Christ Rules Bible Christian Church. She aspires to be an emissary of people with disabilities. Raquel started the campaign called Novel Cerebral Palsy Awareness Drive by featuring her disability in her works. One of the things that I loved about the book is it had different points of view (POV). I was never a fan of books that told the story in the first person POV of the lead character throughout the story. 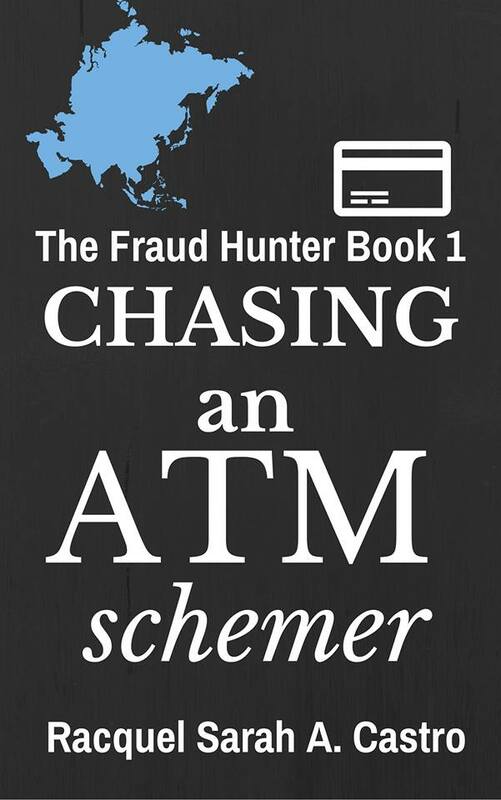 I am glad “Chasing An ATM Scheme” was not that type of book. While I wanted to know why Teri Francisco became an ATM schemer, I also wanted to know what others were thinking about the situation or what was happening in their lives. Through the POVs of different characters, I saw that no matter how nice or how bad a person is, everyone has a secret. I also liked that the author made the setting so Filipino and did not hide any flaws. Not everyone is liberal enough to discuss one of the known crimes in Metro Manila: ATM scamming. But Raquel was able to do that and put a personal touch to it, like telling readers the reason why Teri Francisco is doing this crime. By doing so, she showed everyone that there are criminals who do crimes for personal reasons. That not everyone is evil. Yet, despite that, Raquel also showed that criminals are criminals and they should be given the proper punishment that they deserve. In relation to that, the story does not show just one side. Raquel tells readers that you should look at different angles to see why one person is doing something or why this situation is happening. It’s not easy tackle that kind of topic, but Raquel was able to do that in the characters of Teri Francisco, Gabe Jacinto, Carrie Rios, and many more. All in all, “Chasing An ATM Scheme” is a simple yet intriguing story that will make you curious as to how the story will end and what the characters’ fates are in the future. I can’t stop reading the book because I wanted to know the ending. The story is also a bit open-ended, so I am curious what will happen with the other characters and if we’ll see more of them in the next books. Have you read “Chasing An ATM Scheme” by Racquel Sarah A. Castro from the #HeistClub? If you have, let me know your thoughts about it by leaving a comment below. You can also talk to me on Facebook, Twitter, and Instagram.